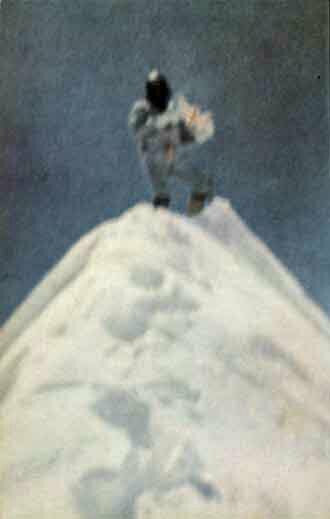 Don took his power and skills further afield: The Alps, Himalayas, Patagonia. 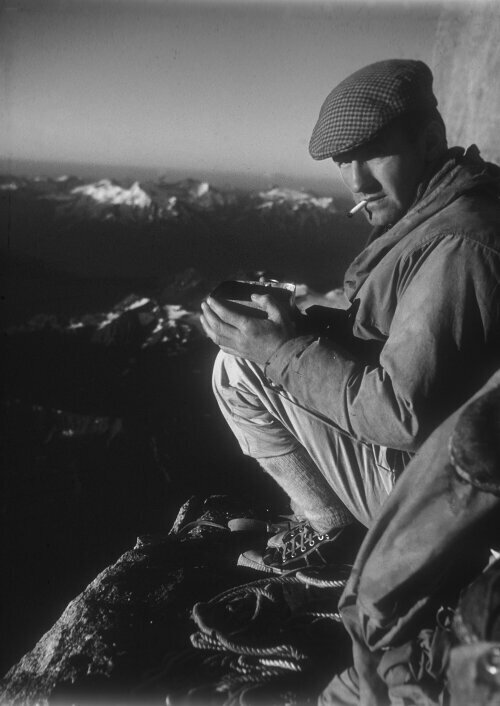 Again putting up inspiring first ascents on difficult lines that stymied his contemporaries. I’ve posted a similar image before, but here it is a a different light. 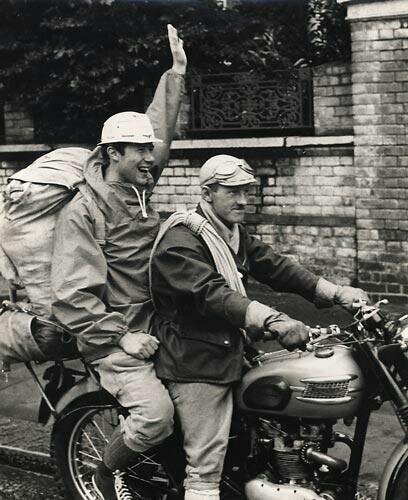 A late fifties shot of Triumph Tiger pilot Whillans and pillion Chris Bonington setting off for an attempt on the notorious Eigerwand. This is recreated in the eighties about the same time as yesterdays posts subject. Both travel worn and aged but still a twinkle in their eyes. 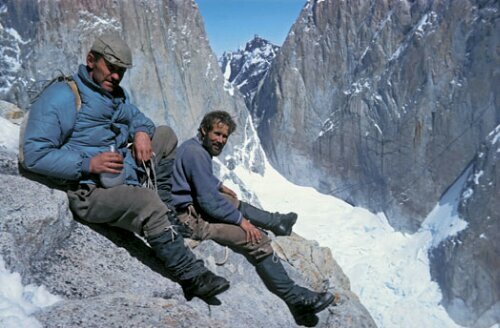 Here’s Don & Chris in the Alps at the Central Pillar of Freney, a severe rock face high up on the Mont Blanc massif. 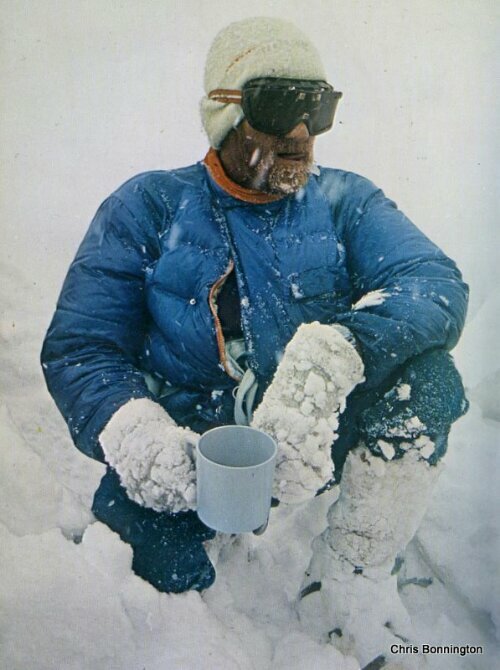 Exploits took him to the South Face of Annapurna. He developed mountaineering equipment: the expedition box tent, Whillans climbing harness. 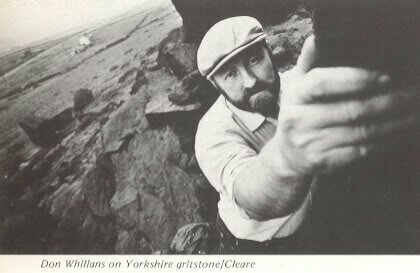 A background as a plumber not only strengthened forearms..
Whillans rounded a bend and stood face to face with a mysterious Indian in a large turban. As was customary, the Indian held out his hand to receive a contribution. 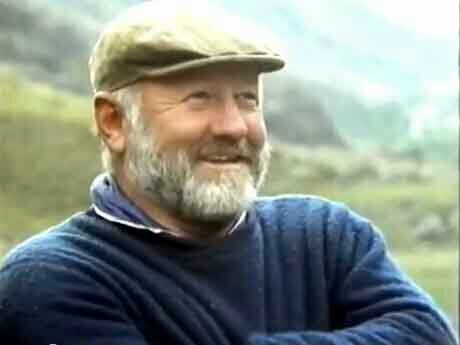 “Hmm, are you on some sort of sponsored walk?” asked Whillans and shook the surprised man’s hand. What a place to sit with a brew, smoking a fag after a good day on the mountain… A deepening shadow in the Chamonix valley and the Aiguille Rouges deepening in color of an Alpine sunset. The ‘ard little man in the flat ‘at! 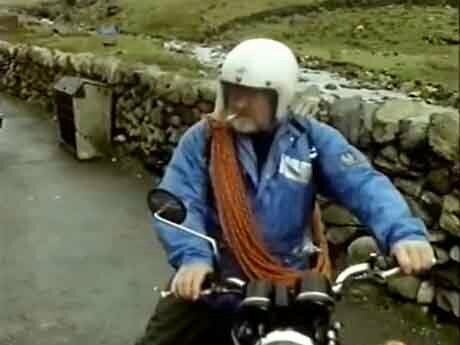 “Is that to protect yer head or to keep yer fag dry?” Quips the great Joe Brown to a rope-wound motorcyclist as he dismounts from a damp ride along the craggy mountain bound Llanberis Pass in North Wales. The dour response in straight Mancunian: “me fag!”. 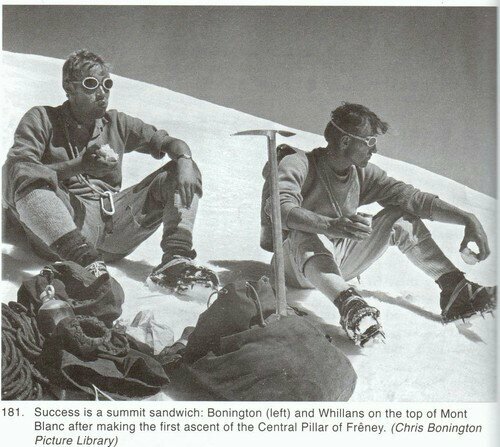 This is none other than climbing Legend Don Whillans. 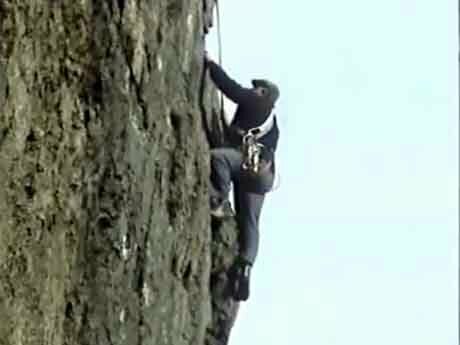 These are captured scenes from a recently unearthed documentary from 1985 capturing Don’s last climb. 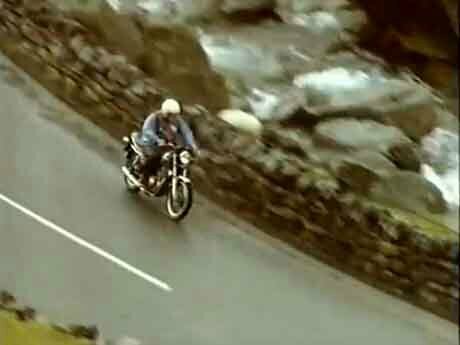 There are some well filmed shots of the road up the ‘Pass’ . 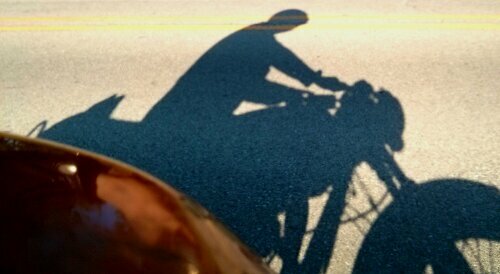 Don ever the motorcyclist winds his way along smoothly on a Kawasaki 440 twin. Coming to a halt in the layby below the imposing open-booked corner of Dinas Gromlech he meets up with his climbing partner of decades before and that day, Brown. 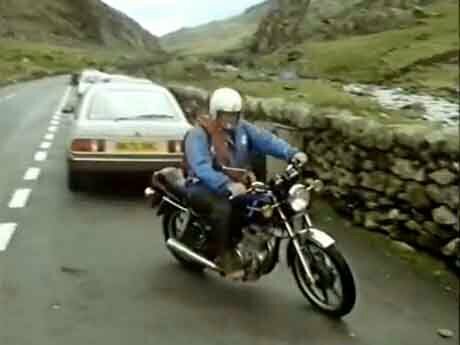 His blue Belstaff jacket will have seen many damp miles across Northern England. Whereas Joe cuts a lithe figure for his, at the time, mid-fifties; Don is a heftier, pot-bellied, mountain of his younger and doughty youth. 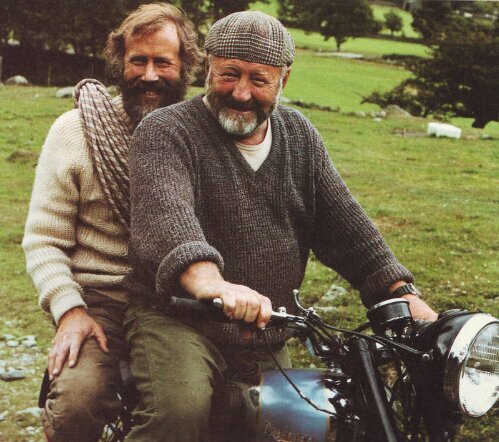 Back in the day they were a force to be reckoned with putting up the hardest routes, still test pieces to aspiring hard climbers, considering they climbed with rudimentary gear: hemp rope, M&S plimsols and sack loads of working mans bottle. The climb they were retracing that day was the steep crack system called Cemetery Gates, graded E1 5b (E for extremely severe). 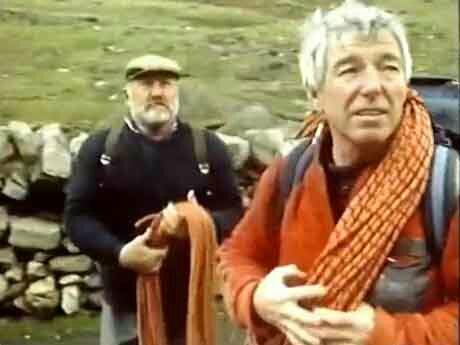 Joe strolled up it in fine style as leader, however Don needed a few tugs of the rope as second to help his 14 stone figure up the crag. 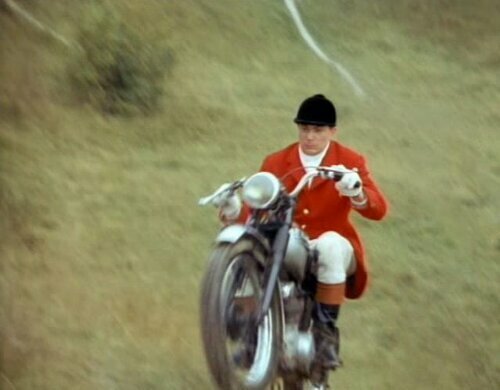 He died two months after this was filmed at the age of 52. The Nepali Sherpas called him Tiger; he’s also been known as The Villain. Nevertheless he was the climbers climber. 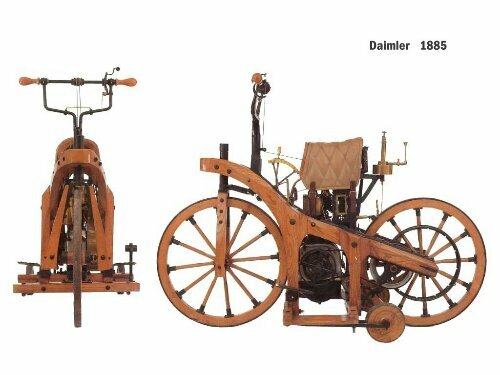 128 years ago today Herr’s Wilhelm Maybach & Gottlieb Daimler took their internal combustion engined two wheeled contrivance to the patent office thus ensuring their place as the fathers of the motorcycle. 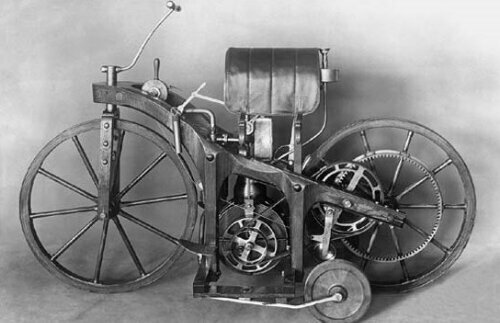 It was basically a boneshaker with stabilizing outriggers supporting their newly developed ‘grandfather clock’ single cylinder petrol engine, basically a test-bed for use in carriages and boats. 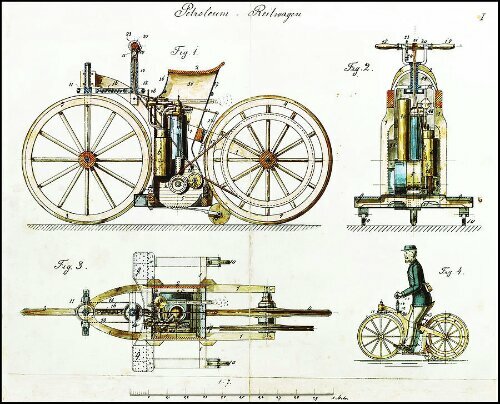 It heralded a new age of transportation that wasn’t the commonly used but relatively inefficient steam engines and their hunger for coal which had ushered in the Industrial Revolution a century prior. The original was destroyed by fire in the early 1900’s however reproduction illustrate its simple efficiency. 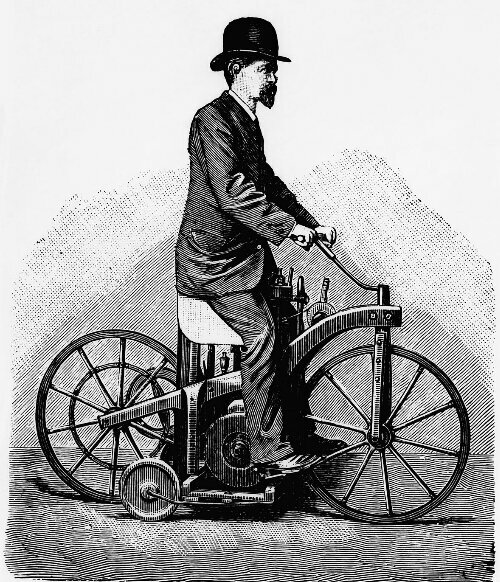 With zero rake and no trail the self balancing and gyroscopic marvel of the motorcycle we know today wasn’t experienced; but hey! You gotta start somewhere! 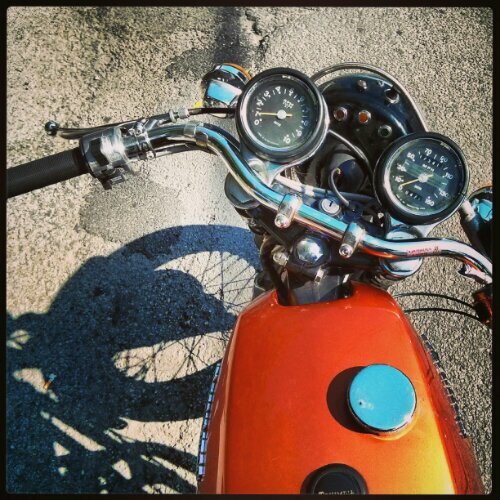 Any way: Happy Birthday Motorcycle! Daimler lives on as the parent company to Mercedes Benz, however the Maybach marque went defunct this year. 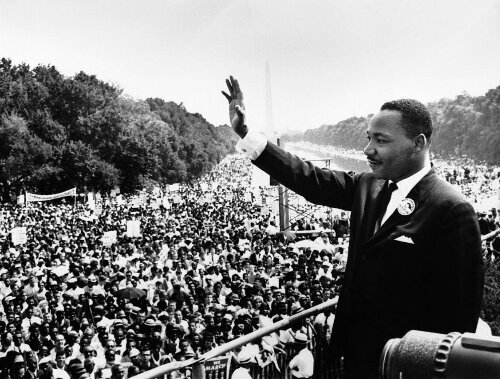 Today marks half a century since Dr Martin Luther King Jr. gave his inspiring speech on the pursuit of happiness to a quarter of a million strong crowd gathered in DC from all corners of the ‘States. 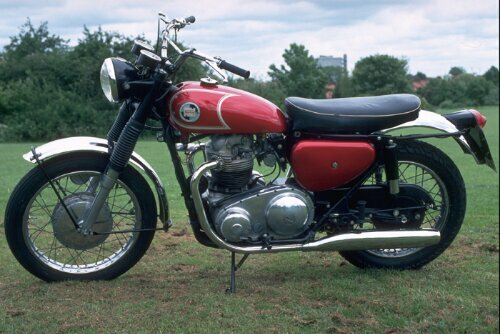 Well… At that time there was another Dream hitting the roads of the Nation: Hondas 305cc twin that gave a new level of reliable easy and fun transport. Not quite red, white and blue… But near enough! 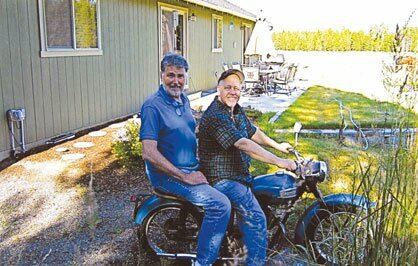 As a side note a Dream was the moto Robert M. Pirsig rode, subsequently enabling his classic Zen and the Art of Motorcycle Maintenance to be written. I think we’ll cover those philosophical meandering about the pursuit of quality another time. 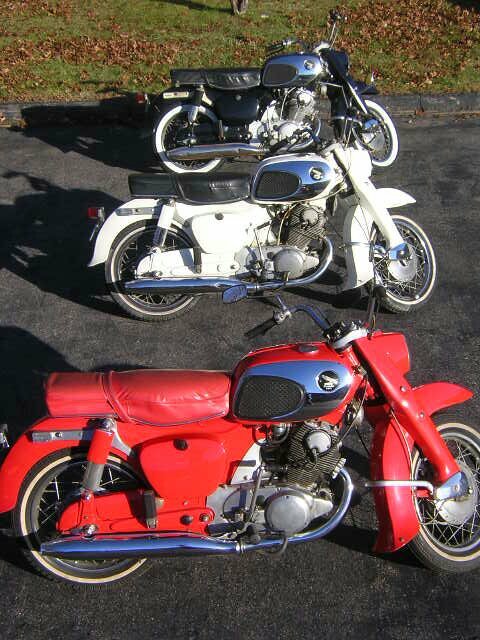 The ideal starter bike, nimble, smart appearance (it was the Baby Bonnie) and fuel efficient. 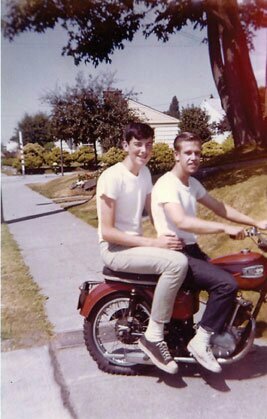 Here’s the real deal a fifteen year old Tom Foote on his ’59 Cub in ’63 with his friend Jim. Happy Campers both. Half a century later they recreate their youth. 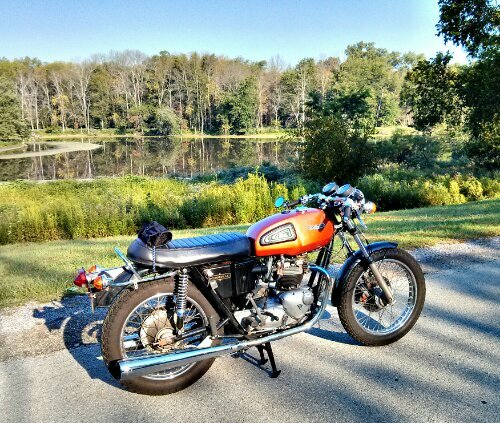 Same bike too! Stretching ever out of reach. While the faint, slow wind creeps past. Dark with many a weather-stain. Vivid mosses in the bogs. What delights in thee I find! Like a fragrance in the mind. Open on my thoughtful eyes. The soft branches of their store. Floating on the weeds below. Fairy chimes for me all day. Memory sets the bells a-ring! That I love thee like a friend! All thy loveliness will end. With the tramp of careless feet. Winding through the forest green. And I hear the wild birds sing! 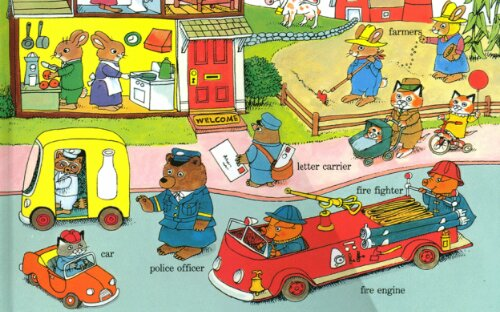 One of my favorite books as a young kid was Richard Scarry’s illustrated sort books. 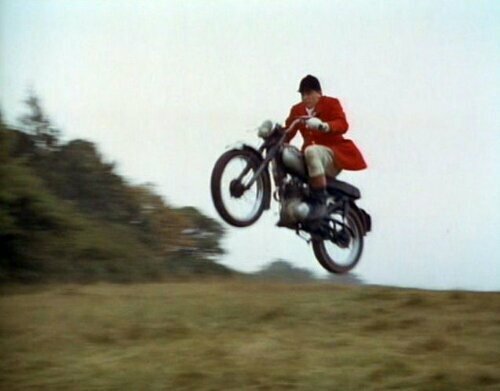 They all involved animals as people in all traditional ethnic roles. Cats, dogs, foxes, worms, rabbits, pigs and usually a large lumbering bear. 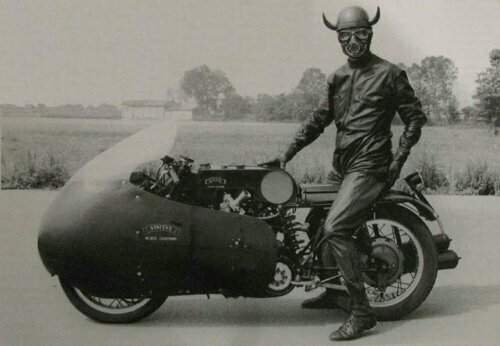 So when I found this vintage photograph it reminded me of his world made real. 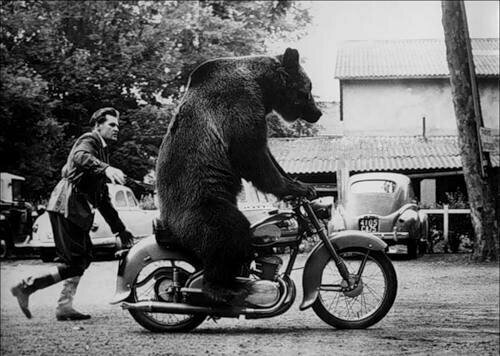 It seems bears have good balance. 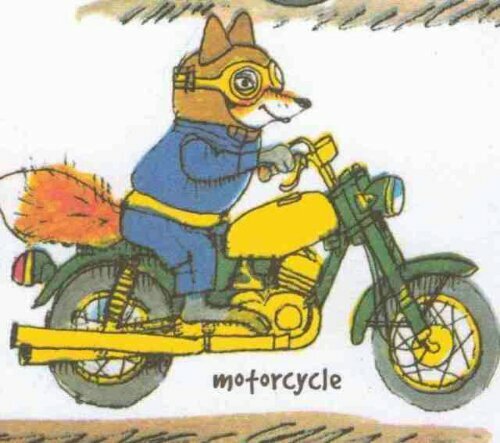 And for a reminder of his loose illustrative style. 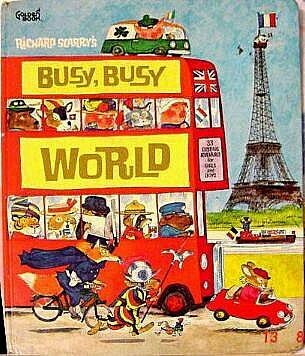 Lively, chaotic, family, work, food: Busy. 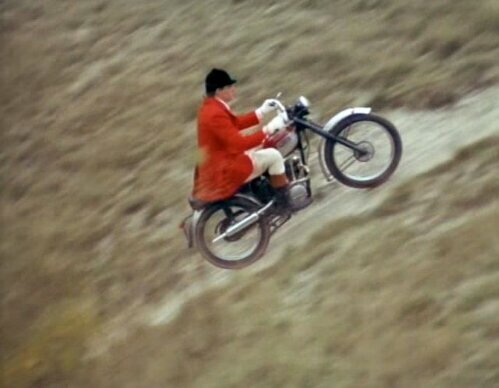 It seems that The Man with No Name liked the twin three quarter litre moto so much that he is later seen on a blue high piped Commando..
Back to that Alistair MacLean adapted adventure war movie. 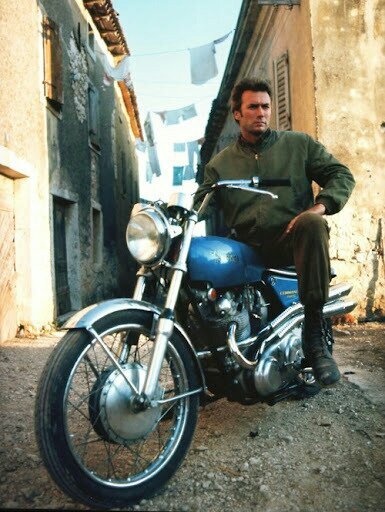 Still one of my favorites; combining Clint with Richard Burton was inspired. 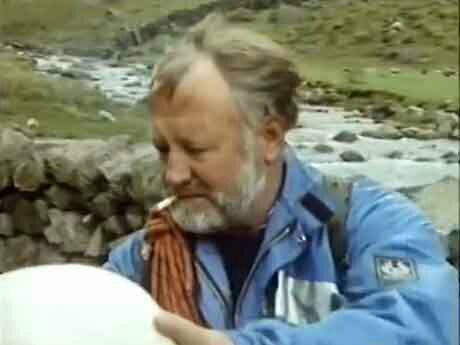 “Broadsword calling Danny Boy, come in, over”. 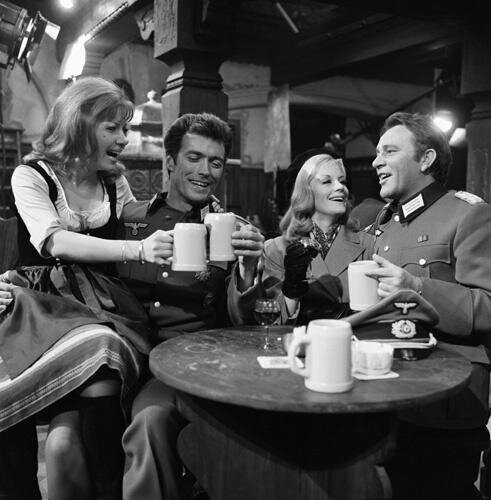 The delightful and beautiful Mary Ure and Heidi Pitt as Allied Agents playing Bavarian Fraulein look on as Schaffer (CE) and Major Smith (RB) sup at their steins of lager. 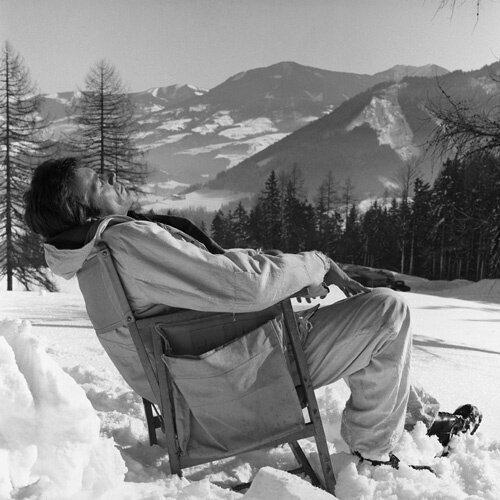 Moments of respite during location shooting allow our Harry Callahan sitting in an Austrian snowfield looking over the nearby Alps. 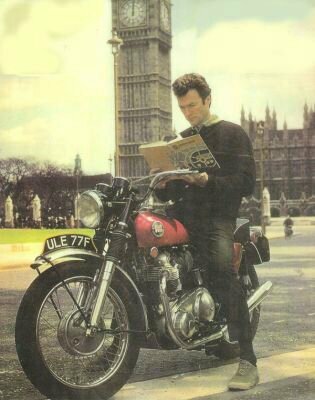 Let’s have another look over that Norton 750…a popular motorcycle of the time and used to some sucess as a desert sled. 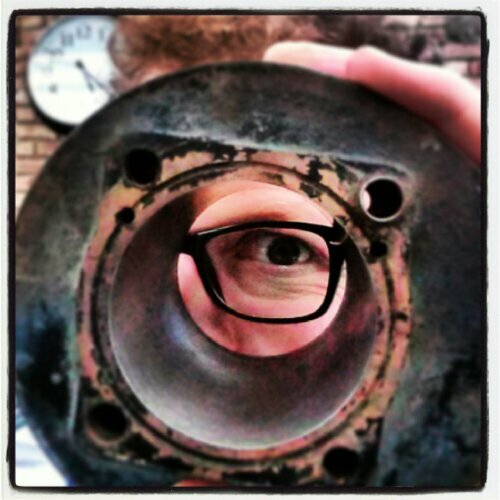 A barrel arrived today for the Triumph Cub project. In terrific shape with a clean bore, nearly complete fins and a piston too! 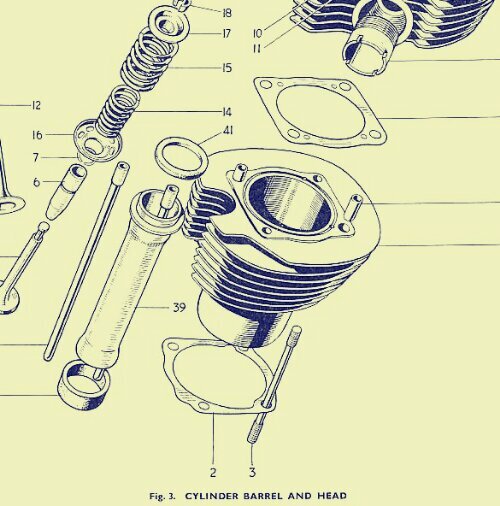 …some assembly required of course! 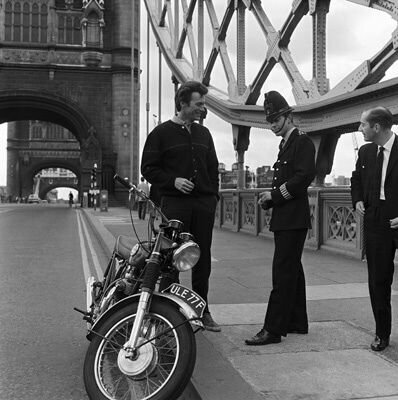 Our favorite 60’s TV duo john Steed and Emma Peel managed to get into all sorts of scrapes and escapades. 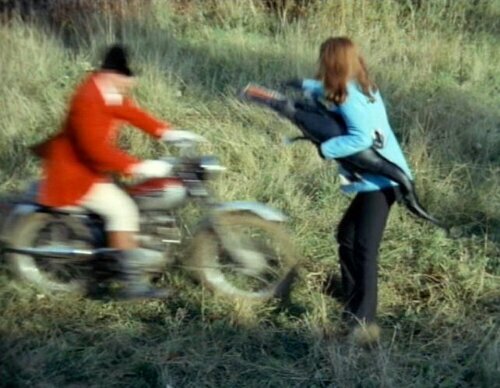 It usually involved a fight or chase scene with our action gal Diana Rigg. 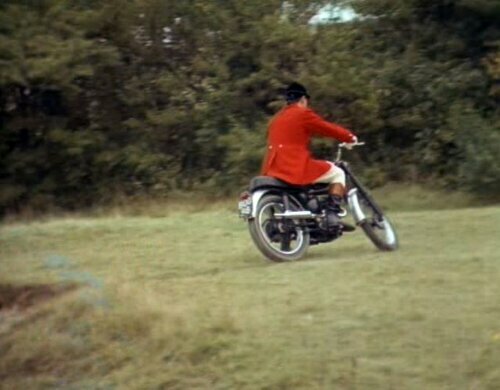 Here we have a hunting redcoat clad Triumph Cub rider chasing her over field and moor. 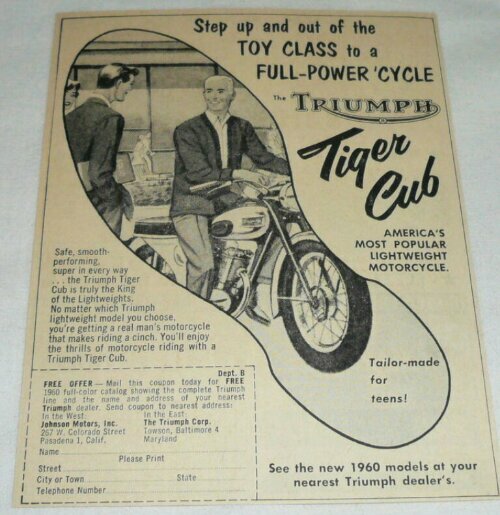 This is the nimble Mountain Tiger Cub model. 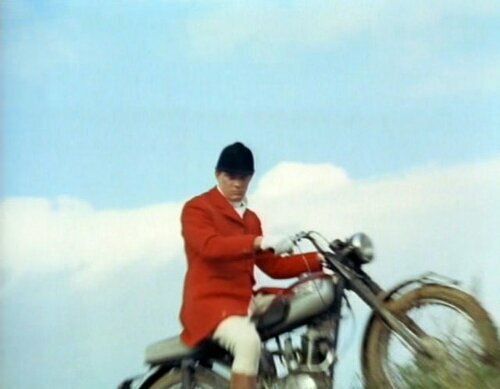 They always managed to catch their guy, and conclude the episode with some quippy remarks. 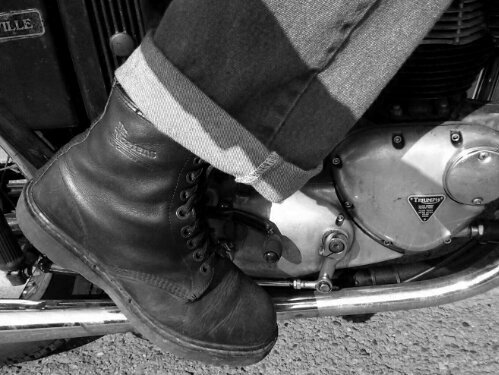 My trusty pair of 8-hole Doc Martens 1460’s are the perfect boot for the old bike. Hefty for kicking the engine over from cold. Non-slip soles when dabbing your feet down at lights amidst the occasional oily smear. High coverage over the ankle for protection. Chunky toe for solid shifting. And, above all else… They are The Business! 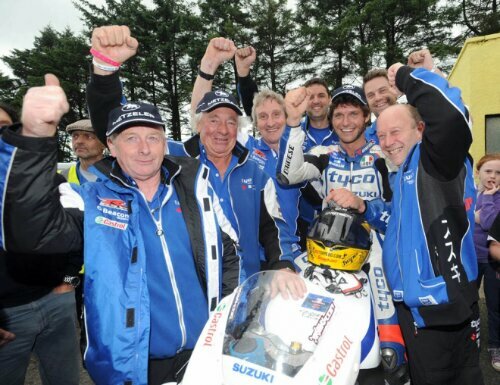 Our lad Guy Martin pulled out a hat trick with his three wins this weekend at the Ulster GP. 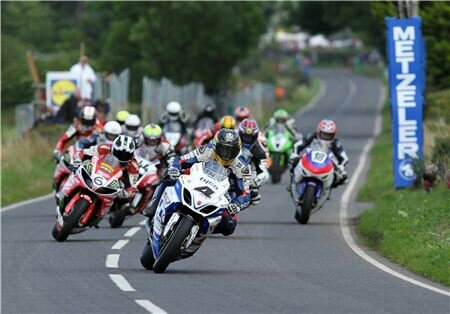 All being closely followed on his heels by the Dunlop lads amongst others. With an unmatched average lap speed of 132.938mph on his second of seven laps in the Superbike he pipped Michael Dunlop by 0.054s. At that speed that is as close as you can get!